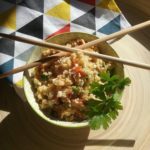 Cauliflower Fried Rice is a delicious lower carb take on the traditional fried rice. 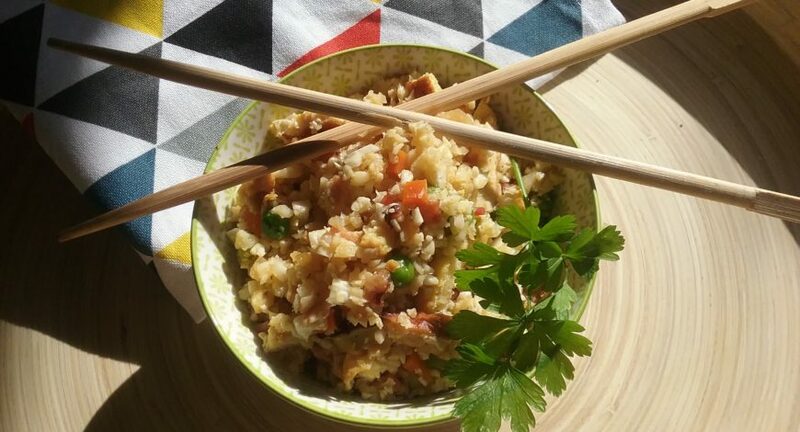 Using a food processor, finely chop the cauliflower flourets into a rice like texture. Finely chop the onion, bacon, capsicum and carrot. Whisk the eggs together. Add fish sauce to eggs and whisk again. Heat Sesame Oil in pan and add eggs to make an omelette. Once cooked, remove from pan and set aside. Heat Coconut Oil in pan and add onion and bacon. Cook until onion and bacon is cooked through. Add finely chopped capsicum and carrots to the onion and bacon and mixture and cook through. Add peas and stir. Add cauliflower rice to the mix and stir thoroughly. Add Coconut Aminos and Coconut Sweet Chilli Sauce and mix through thoroughly. 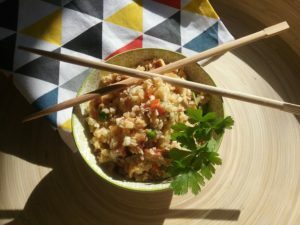 Slice the egg omelette and add to the cauliflower fried rice. Add parsley and stir through. Heat gently and serve. Enjoy!